You should have Node 8.11+ installed on your machine. Some familiarity with TypeScript will be helpful. In the previous tutorial we have created the server side of our chat application that uses TypeScript, Nest.js and Chatkit. Now, in the second tutorial, we are going to create the frontend mobile application using Ionic 4 and Pusher Chatkit. You can find the source code for this part in this GitHub repository. Recent versions of Node.js (v8.11.2) and npm (v5.6.0) installed on your system. Being framework-agnostic doesn't mean that support for Angular is dropped. In fact, the Ionic team is also working on the Ionic-Angular v4 package that could be seen as the next version of Ionic 3 (which could be only used with Angular). Note: Please note that depending on how you configured npm in your system you may need to open an Admin command prompt on Windows or run the command with sudo in macOS and Linux if you want to install packages globally. As the time of this writing, Ionic v4.5.0 is installed. The blank starter: it provides a base blank project with one page. The tabs starter: it provides a base project with tabs. The side menu starter: it provides a base project with a side menu. Note: You also need to specify the type of framework to use with the --type=angular option, which is new in Ionic CLI v4 (For now the CLI supports only Angular). The Ionic CLI will prompt you if you want to integrate Cordova. No if you only need the web version of your project. For example, to develop a Progressive Web App. You can enter No for now since we’ll be using the browser for testing. You can also enter No for Install the free Ionic Appflow SDK and connect your app? If you don’t want to install Ionic Appflow SDK. Your application will be running from the localhost:8100 address. We'll be importing this library in our project in the next section. Note: At this point, you can start your development server with ionic serve to make sure you don’t have any problems starting your app. After installing the client SDK, we'll create an Angular service that handles authentication in the mobile application. AUTH_SERVER holds the address of our authentication (Nest.js) server and authState. That's it, we've finished with the authentication service. In the next section, we'll see how you can use this service for adding authentication to your application. That means we can access this page from the /register path. We simply call the register() method of the authentication service and we pass the form value then we subscribe to the returned observable. After registration is successfully done we navigate to the login page. 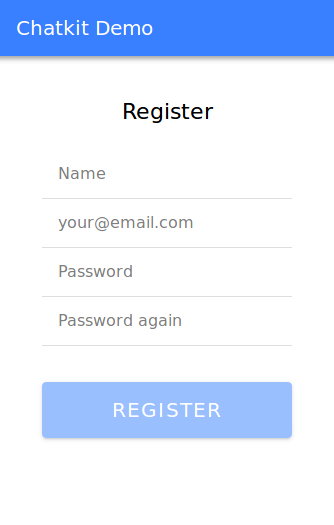 In the form, we bind the register method we created before with the ngSubmit event so the method gets called when the user submits the form. In this method, we call the login() method of the authentication server and we pass the form data (email and password) using the .value member variable of the form instance. Next, we subscribe to the observable and check the status of the returned response. If the request is successful i.e res.status == 200 we navigate to the home page of the application and we pass user_id as a parameter to the home/ URL. Otherwise, we simply set showError to true. That's it for the authentication part, next we'll be working with Chatkit to add chat features to our application. The command will create the src/app/chat.service.ts file that contains the actual code for the service and the src/app/chat.service.spec.ts file that contains the specifications or test units. Now open the src/app/chat.service.ts file, and let's add the code to link our application to Chatkit. Finally, we use the subscribeToRoom method to subscribe to our room. This will allow us to be notified when new messages or users are added to the room. We pass in the room ID, a hooks object and a message limit number. In our case, we are using the onMessage hook that gets called for new messages. This will allow us to get the list of users in the room. That's it for our chat service, next we'll use this service to implement group chat in our mobile app. On the ngOnInit life-cycle event of the component we first retrieve the user id from the route path then we call the connectToChatkit method of ChatServiceto connect the Chatkit. Note: HomePage needs to implement OnInit i.e export class HomePage implements OnInit. Finally, we subscribe to the getUsers method of ChatService to get the room's users and add them to userList. This will allow us to check if the user is online. We simply loop over userList and display each user's name, avatar and online status. We use CSS Flex layout to style each list item. We loop through messageList using the *ngFor directive and display each message text, and sender information like name and avatar. We bind the sendMessage method to both the text-area enter and the button click events which allows users to send a message by either pressing Enter or clicking on the button. Note: Please note that you first need to register by visiting localhost:8100/register where you need to enter your name, email and password. 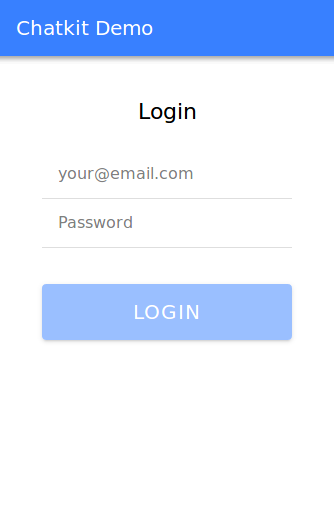 After registering you’ll be redirected to the /login page where you need to enter your email and password. If login is successful, you’ll be redirected to the home page where you have the START CHATTING button that you need to click on in order to navigate to the chat page. In this tutorial, we've created a simple group chat app using Nest.js, Ionic 4 and Chatkit. You can also leverage Chatkit to allow private and direct chats between users by creating rooms that have only two members and you can allow users to create their own chat rooms and invite users they want and other features that you can read about from the docs.